Being able to start a fire is an import skill an outdoorsy person should know. This is because starting fires are very important when in a survival situation or just an enjoyable commodity where you can sit back and relax with friends and family. Yet there is always a danger starting a forest fire, burning yourself, or not being able to start a fire fast enough. In a survival situation starting a fire quickly can be life or death even in a non-survival situation weak fire skills can lead to a bad time. Today I will be reviewing a new fire starter. I was able to get a few samples of a product called InstaFire from my current boss. He was able to score the sweet swag from a TrueValue market. 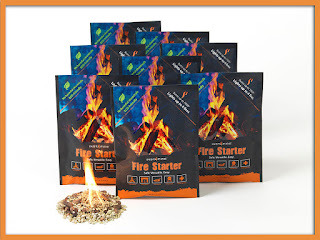 InstaFire is a granule like fire starter most commonly in a two oz bag. So we were very excited to try this product out to share with you fine readers. One of the best things about InstaFire is its ability to burn anywhere. It will burn when wet, float on top of water while burning, or burn on snow. A 2 oz pouch will get you through multiple fires too! Each pack has enough for about four fires when used properly. Furthermore, it lights very quickly and easily. We were able to light it with a lighter, matches, and flint and steel with no issues. Moreover, InstaFire burned for a surprisingly long time. Finally, this product is very inexpensive coming in at less than two dollars per 2 oz bag. As great as the product was. There were a few issues. First, InstaFire is bulky compared to other fire starters. It comes in a huge bag similar to freeze dried meals. Second the packaging wasn’t designed environmentally friendly. The bag is not biodegradable, recyclable, or burnable. One of the issues with granules, it's very easy to spill or have a strong wind make a mess of you work. Finally, be prepared to stir because you won’t get maximum burn life if you don’t. This would be a great product for a doomsday or an emergency prepper because of size not being the biggest problem. But one bag can be used for four different fires if used properly. They also have InstaFire in larger containers for emergency fuel. They have also created a charcoal starter for easy bbq. The charcoal starter has a burnable package which I hope they implement with InstaFire to make the already great product better. We really like this product. It lights very easy and burns. But for hiking, backpacking, or bug out bag there are a few better options where size is a priority. Although for a natural disaster kit for your home where space isn't as much of an issue this would be an amazing product to have around. So what are you using to make your fires? Make sure to keep up to date on all our adventures by following us on Facebook.